Femi is back! 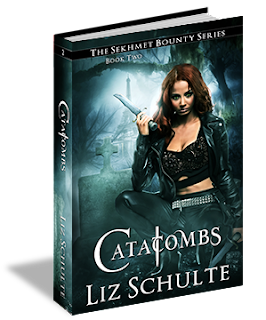 Join her as she travels deep into the catacombs where she will unearth more than a few secrets. Blurb: You know what’s worse than being blackmailed by a secret council? My family. But somehow I was roped into a mission that required me to deal with both. If it weren’t for bad luck…well you know the rest. Shezmu, the god of ointment with a penchant for dismembering bodies, made himself known in the catacombs by chopping up fifteen innocents and putting them on display. Despite the fact that Shezmu killed my father, the council determined I was the best person to send on this “diplomatic” mission. All I had to do was convince him to go home, thwart whatever the council’s real plan was for the contradictory god, and save the world from everyone else’s personal agendas—or as I call it, just another Tuesday. Everything should have been simple enough, but it wasn’t. This mission was personal and when things get personal, lives change. But not always for the better. Thanks for this genuinely awesome post.Its seems true. i love making this now.thanks for the top. It became very useful.You made it and that they simply grew to become out well.satisfied to study your submit.